Congressional Democrats on Tuesday called for civil rights protections for American workers, an end to the tipped wage and transparency in the workplace as part of sweeping legislation to end workplace harassment. 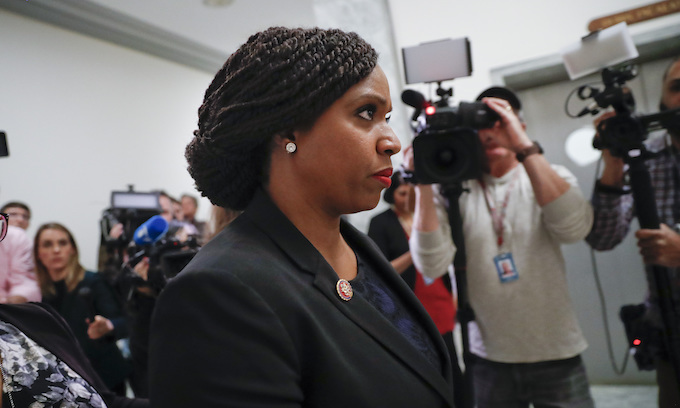 Sen. Patty Murray of Washington, along with Reps. Katherine Clark and Ayanna Pressley of Massachusetts, Elissa Slotkin of Michigan, and Debbie Mucarsel-Powell, introduced the so-called Be HEARD Act during a news conference on Capitol Hill. It stands for Bringing an End to Harassment by Enhancing Accountability and Rejecting Discrimination in the the Workplace Act. The key features of the act include legislation to invest in research about the impact of workplace harassment, an end to mandatory arbitration and pre-employment non-disclosure agreements, an expansion of civil rights protections, legal assistance for workers who come forward to report harassment, and an end to the tipped wage. Murray representatives were inspired to write the legislation in part because of reports of abuses of power in Hollywood and Congress. “What we wanted to do was shine a spotlight on workers who were’t in those headlines,” she said. “We found that millions of workers are not protected under our civil rights laws. Also supporting the bill were a number of 2020 presidential contenders, including Sens. Cory Booker of New Jersey, Kirsten Gillibrand of New York, Kamala Harris of California, Amy Klobuchar of Minnesota, Bernie Sanders of Vermont and Elizabeth Warren of Massachusetts. enough with protecting blacks,queers,and anything else demoncrats want laws for. we are all americans until politics interviens and there goes the neighborhood. black folk need to understand that you are not SPECIAL! AND Don’t we already HAVE ENOUGH “Work place harassment” laws on the books.. SO WHY THEN DO WE need yet another one?! We do need another one Ituser… not this crap listed in the article.. but … one to protect MALE workers from women who dress provocatively and use their sexuality to get what they want, so they get the male workers to do more than their fair share of the work! I … NEVER… hear about that scenario. I see happen all time with my employees. If an employer says anything… then a team of lawyers draw and quarter them, set them on fire then urinate on them to put out the fire. OR one to protect men from false accusations!!! Typical Democrat stupidity. The simple fact is, you can’t fix cowardice with legislation. We already have the necessary laws in place to address this. When a young actress wannabe decides to give her career precedence over her honor, she is making a character defining choice. No legislation can fix her character flaws. If she fails to report a sexual assault out of fear, she is being cowardly; no new law can fix THAT either. Hey Murray, you are a Senator from WASHINGTON STATE. Why are you pushing Federal legislation based on your perceived mistreatment of people other than those that we sent you to DC to represent? Shouldn’t the easily outraged at any (vote getting) slight representatives from the Granola State be leading the charge? As for Congress having problems in you eyes with treatment of employees, Talk to Chuck and Nancy about cleaning up their act. I can’t wait until your next reelection effort, I am excited about the prospect of getting you back to the “mom in tennis shoes” role. You know, the one you had before you weaseled your way into the Senate. That’s a good question. WHY IS SOMEONE from DC or Al, pushing legislation, because of something that happened in Ar or Ks?? IMO IF THEY ARE NOT REPRESENTING THAT STATE< but the hell out.